This post from 2010 links to World Net Daily, a website that has been known to promote conspiracy theories, and does not meet Business Insider’s current editorial standards. We regret the error. Paid your taxes on time? Good, ’cause Nancy Pelosi needs to pay her tab. And by “services,” she clearly meant alcohol. 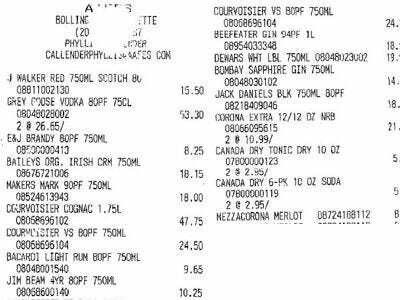 Look at all the booze on this receipt pictured right! WND: But that single receipt makes up just part of the more than $101,000 taxpayers paid for “in-flight services” – including food and liquor, for House Speaker Nancy Pelosi’s trips on Air Force jets over the last two years. That’s almost $1,000 per week.